Хью Лори. . Wallpaper and background images in the Хью Лори club tagged: hugh laurie actor house md laurie hugh. This Хью Лори photo might contain длинные брюки, проезжая часть, проезжей части, улица, город сцены, городских условиях, город сцена, урбанизация, and городских настройка. Too cute! 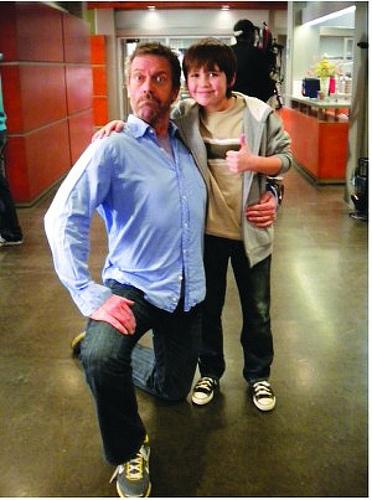 Hugh is always so funny ... more so when kids are around! Thanks for posting! This is the kid from the Super Bowl commercial, right? The kid in Dexter too.. The one who plays Cody.. He loves so much kids!